The season might be getting closer to its end, but Real Madrid's thirst for goals is still quite active. The Merengues defeated Malaga by 6-2 this last Wednesday, in a game where six Merengues players added their name to the scoresheet. 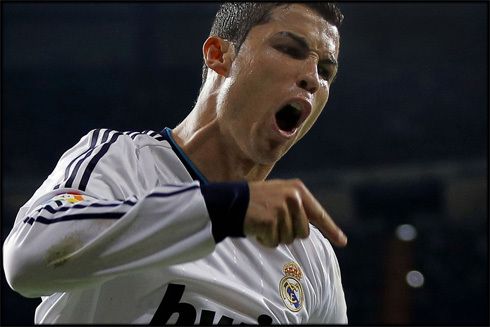 Cristiano Ronaldo was one of them and actually reached his 200th goal for Real Madrid. The first goal didn't take that long to arrive. A corner kick on the left taken by Luka Modric found Raul Albiol rising higher than anyone else on the pitch, to head it past Caballero. The Merengues got the first lead and Malaga were forced to respond in the following minutes. Pellegrini's side found a way to even things from a similar set-pieces play and a corner kick earned 12 minutes later allowed Roque Santa Cruz to easily push the ball into the back of Diego Lopez net, making it 1-1 at the scoreline. Once again Real Madrid exposed one of their biggest weaknesses, which is defending set-pieces and particularly corner-kicks. There wasn't much Diego Lopez could have done, but the same cannot be said about the defensive markings going inside Real Madrid's penalty area. The 21th minute would turn into a capital moment in this game, as Malaga right-back Sanchez got sent off after pulling Cristiano Ronaldo, when the Portuguese was about to finish a play with only the goalkeeper in front of him. The referee didn't hesitate too much and pointed to the spot, at the same time he showed the red card to Malaga's defender. Ronaldo naturally stepped up to take the penalty, but surprisingly missed it, as his shot got blocked by Caballero legs. Against 10 men on the pitch, Real Madrid managed to easily threaten Malaga at their back and would reach the lead at the 26th minute, from a free-kick very near to the goal line. Cristiano Ronaldo blasted the ball into the back of the net after a short pass by Xabi Alonso and put the Merengues in the lead for the 2nd time on the night. Cristiano Ronaldo's celebrations were quite unusual and the Spanish press won't lose any time in interpreting his gestures and respective meanings in several different ways over the next days... The truth is the Portuguese player celebrated with fury and few football kits could have probably resisted all the pulling that took place at the time. However, Malaga still had something left to say in this game. The Portuguese left-back Antunes, decided to show he also has a good right foot and just two minutes after Ozil's goal, he curled a perfect shot into Diego Lopez corner, to make it 3-2 and put Malaga back in the game's discussion. Still plenty of time left to be played and surely a lot more goals waiting to be scored from that point forward. Malaga was down by 1 in the scoreboard and on the pitch, but they were showing the right attitude to still have a say in this game. The 5th goal came out in the 63th minute and this time it was Luka Modric who found a way to put his name in the scoresheet. The Croatian picked a pass from Karim Benzema with his his right foot, quickly prepared himself to shoot at the target with his left and got rewarded with a nice goal, but not before seeing the ball still hitting the left post of Malaga's goal. The final 6-2 would came at the end of the game and it was basically Angel Di María's responsibility. The Argentinian showed all his class and with a left-foot shot still outside the area and he struck the ball away from Kameni's reach, to put Real Madrid on a more than comfortable 6-2 lead. Game, set and match for the Merengues and Barcelona will now have to wait for the weekend, in order to finally have an opportunity to celebrate La Liga title this season. 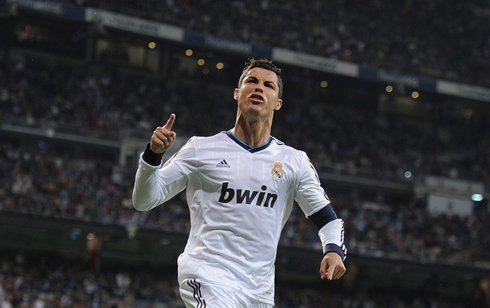 Cristiano Ronaldo next game for Real Madrid will be against Espanyol for the Spanish League, on May 11, 2013. You can watch Juventus live stream, Espanyol vs Real Madrid, Atletico Madrid vs Barcelona, Aston Villa vs Chelsea and Porto vs Benfica, all matches provided from our soccer live streaming section.